2. Saute the corn and jalapenos for 30 to 45 seconds. 3. Transfer them to an oven safe bowl. 4. Place it in a preheated oven at 350F and cook for 30 minutes or until the corn is tender. 7. Add lemon juice, onions, salt and pepper. 8. Mix well and serve warm or at room temperature. Tip: If desired, add finely chopped tomatoes. 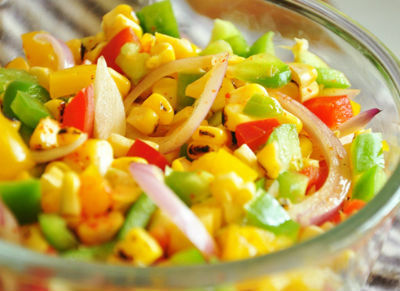 Feel free to comment or share your thoughts on this Roasted Corn Salad Recipe from Awesome Cuisine.